R+S Media Solutions is a major Internet structure provider on all German fairgrounds. Whatever your need is e.g. regular DSL access incl. WiFi, full Cat5 setup for your venue or even handling the most consuming applications, we are the company to talk you. Service reliabilty at budget pricing. R+S Media Solutions policy is Samsung Signage LCD Display Rentals at one of the lowest available prices. Installed and set up by Professionals ensures you as a potential customer the outmost customer and viewing Experience. Quality Display Rentals matter. 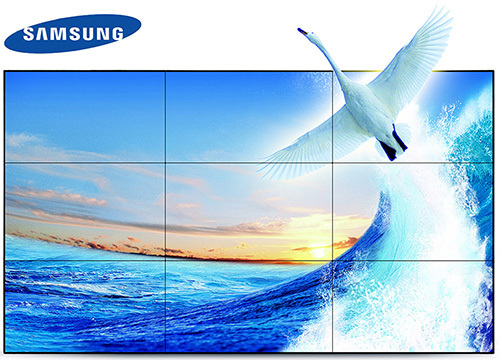 R+S Media Solutions policy is Samsung Pro Grade Video Wall Rentals at one of the lowest available prices. Installed and set up by Professionals ensures you as a potential customer the outmost customer and viewing Experience. If stand size is above 35sqm2, 20Mbit/s DSL option is not available.In case order placed DSL is upgraded to 50Mbit at regular costs. 2.4/5Ghz Dual WiFi network only available with 50+Mbit/s DSL Access. Client is in charge of using a 2.4Ghz WiFi network. Client is in charge of using a 2.4Ghz / 5Ghz WiFi network. * 20Mbit/s Business Access : Up to 10x devices can connect via WiFi option. Up to 4x devices via RJ45 cable. Speed quoted is measured via RJ45 cable and one connected Laptop. The more devices connected the more the overal connection speed is reduced. DSL connection does include 20GB Data Volume based on fair usage policy. Additional Data Volume of 15GB is obatained a price of 45.00 Euro ex. VAT. R+S Media Solutions is an external Service Provider so therefore our prices reflect the market. There is no need to order any overpriced DSL service. Our goal is zero downtime and maximum reliability at budget pricing. **50+Mbit/s Expert Access : Up to 32x devices can connect via WiFi option. Up to 4x devices via Cat5 cable. Connection Speeds up to 300Mbit/s are possible depending on exact fairground and stand location. Speed quoted is measured via RJ45 cable and one connected Laptop. DSL connection does include true unlimited Data Volume. There is no limitation of any kind in regards of data usage. Price ex. VAT for the complete duration of the show, not based on day to day rates, include DSL connection with specified Data Volume, Modem, optional WiFi Router, delivery to the exhibition stand, pickup at the end of the exhibition. All networks are secured via WPA2. Client is in charge of Electricity = Schuko Socket at the indicated position of the Display needs to be provided. Wall Bracket incl. Security Lock. Mounting up to 190cm top height. Functional Test of Signage Display. Video Wall Floorstand option up to 165"
Client is in charge of Electricity = Schuko Sockets at the indicated mounting position need to be provided. Samsung Push Out Wall Bracket. Mounting up to 240cm top height. Our policy is Pro Grade Video Wall Rentals at lowest available prices. Having served hundreds of Exhibition clients in the past years we have huge experience in setting up Video Walls and working hand in hand with stand constructors to realize even the most diffcult setups. 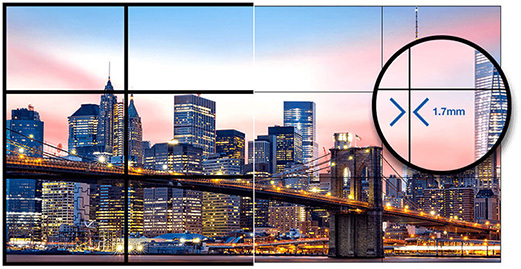 R+S Media Solutions PRO GRADE Video Walls offers market leading Video Wall 1.7mm picture to picture distance seldom found on any fairground with the newest Samsung PRO GRADE Video Wall Displays available. PRO GRADE Video Wall Displays are fully color calibrated to factory spec. All our PRO GRADE Video Wall Displays are fully calibrated to minimize any sort of color differences to ensure you as a possible client the best Video outlook possible. --> Cable Modem with 4x Cat5 Ports supplied. No WiFi required. --> WiFi Option*** : 2.4Ghz WiFi Router, 4x Cat5 Ports, up to 32x connected Clients. --> WiFi Option*** : Dual 5Ghz/2.4Ghz WiFi Router, up to 32x connected Clients. * 20Mbit/s Business Access : Up to 10x devices can connect via WiFi option. Up to 4x devices via RJ45 cable. Speed quoted is measured via RJ45 cable and one connected Laptop. The more devices connected the more the overal connection speed is reduced. DSL connection includes 20GB Data Volume based on fair usage policy. Additional Data Volume of 15GB is obatained at price of 45.00 Euro ex. VAT. Delivery will be done directly to your Exhibition stand one day prior to the Exhibition start during 10.00am until 20.00pm. Several days before the delivery you as a client will be informed via seperate Email about the exact time frame. Payment has to be made on site upon delivery of the DSL modem via credit card only. DSL Equipment deposit value of 295.00 Euro ex. VAT is charged in case of theft, damage or non return of the rental DSL Equipment. No cash payments are accepted. Accepted Credit Cards are : Visa / Master or Amex. Service invoice with seperated VAT will be sent out to sumbitted contact details once payment has been processed. Delivery will be made one day prior to the Exhibition start during 10.00am until 20.00pm if nothing else is arranged. Several days before the delivery you as a client will be informed via a Email about the exact time frame. In case of wall mounting our staff will mount the rented Samsung Display at your in advance specified mounting location. Payment has to be in advance via wire transfer only. No on site payments via credit card or cash are accepted. Once the order is in our system you will receive an order confirmation with the corresponding invoice of the rental service. The Order is confirmed once payment has been received. A deposit surcharge is required to rent the Display. It is the same system well known from car rental companies. Upfront a credit card has to be provided and a deposit charge will be placed onto the credit card. Once the exihibition is over and the Display collected the deposit charge will be released automatically. If no credit card for deposit can be provided we are unable to rent the Display. Delivery will be made one or two days prior to the Exhibition start during 10.00am until 20.00pm. Delivery will be scheduled with you and your stand builder to ensure the Exhibition stand is ready for mounting the Video Wall. In case of wall mounting our staff will mount the rented Samsung Display at your in advance specified mounting location. Payment has to be in advance via wire transfer only. No on site payments via credit card or cash in regards of Samsung Video Wall Orders are accepted. Once the order is in our system you will receive an order confirmation with the corresponding invoice of the rental service. The Order is confirmed once payment has been received. A deposit surcharge is required to rent the Video Wall. It is the same system well known from car rental companies. Upfront a credit card has to be provided and a deposit charge will be placed onto the credit card. Once the exihibition is over and the Video Wall collected in the same condition as delivered the deposit charge will be released automatically. If no credit card for deposit can be provided we are unable to rent out the Video Wall. Delivery will be made one or two days prior to the Exhibition start during 10.00am until 20.00pm. Delivery will be scheduled with your stand builder to ensure the Exhibition stand is ready for mounting the Video Wall. In case of wall mounting our staff will mount the rented Samsung Display at your in advance specified mounting location. Payment has to be in advance via wire transfer only. No on site payments via credit card or cash in regards of Samsung Display Orders are accepted. Once the order is in our system you will receive an order confirmation with the corresponding invoice of the rental service. The Order is confirmed once payment has been received. A deposit surcharge is required to rent the display. It is the same system well known from car rental companies. Upfront a credit card has to be provided and a deposit charge will be placed onto the credit card. Once the exihibition is over and the Display collected in the same condition as delivered the deposit charge will be released automatically. If no credit card for deposit can be provided we are unable to rent the Display.